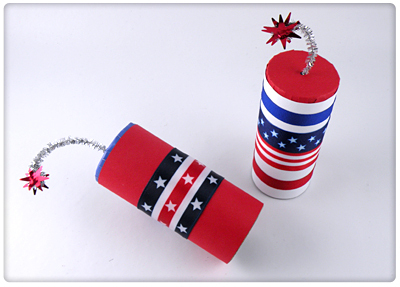 These safe firecracker favors are made from paper towel rolls and filled with bubble wrap. They are decorated with red, white and blue scrapbooking paper and ribbon. The fuse is made from a silver pipe cleaner and a red star is glued to the end of the fuse to make it look like it has been lit. The bottom of the tube is left open so you can pop the bubble wrap with your fingers to make a firecracker sound.